In 2009, we first became interested in the use of foliar-applied sugar for soybeans. 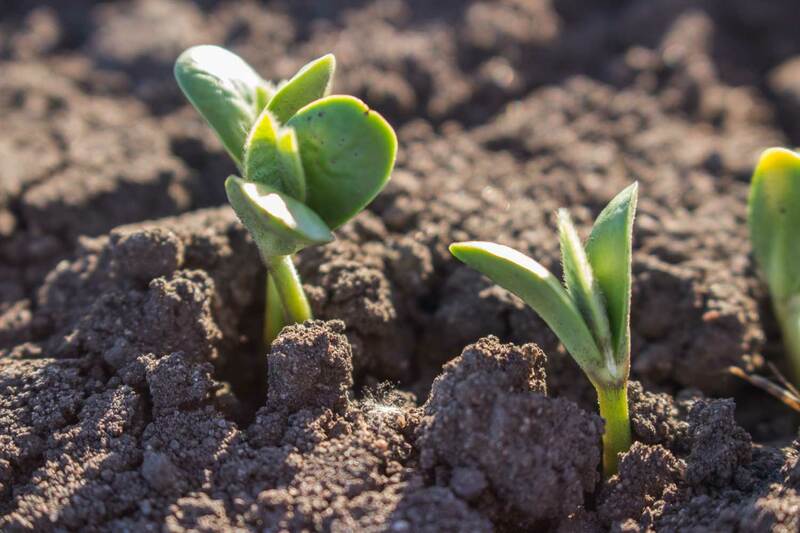 Using white table sugar produced at a nearby sugar beet plant, AgRevival partnered with local growers to test the theory that applying sugar to soybeans would boost yields and generate a return on investment for growers. It was a good theory, but, in the end, the table sugar molecules were too large to enter through the plants’ stomata. And, the sugar crystals acted like tiny magnifying lenses that burned tiny holes in the plants’ leaves. 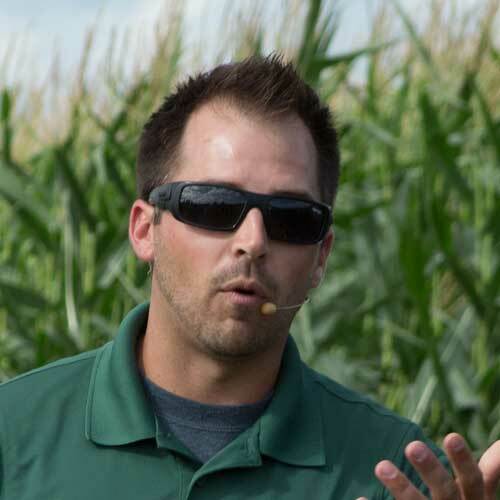 Fast forward a few years and we once again became interested in the possibility that sugar could deliver a yield boost and positive ROI for soybean growers. The industry was once again exploring products that used the sugar molecule as a basic structure. This time, companies sought to eliminate or reduce handling and mixing issues while increasing their products’ mobility into and throughout the plant. Which foliar-applied sugar products work best on soybeans? In 2017 we tested three products: eXceed™ Nano Brown Sugar (Max Systems LLC), Carbose (Genesis Ag), and Standard Feed-Grade Dextrose. We applied each product at the R1 growth stage. To calculate ROI, we used a soybean price of $9.79/bu and the most recent 2018 product prices. In this trial, all three products delivered a positive ROI. Dextrose increased yields by 0.8 bu/ac and delivered a $5.50 per-acre ROI. 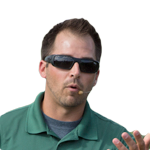 Next in line was Carbose, which increased yields by 0.7 bu/ac and delivered a $5.57 per-acre ROI. 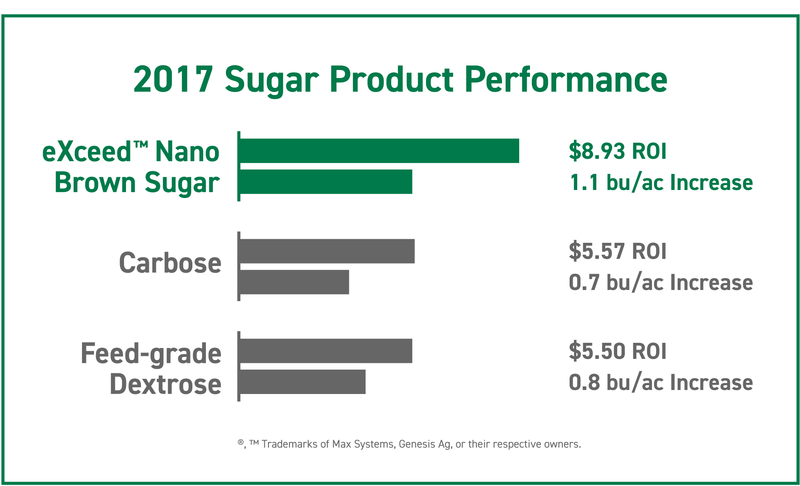 The top-performing product was eXceed™ Nano Brown Sugar which boosted yields by 1.1 bu/ac and brought an $8.93 per-acre ROI. Yield results from foliar-applying various sugar products on soybeans. When is the best time to apply sugar on soybeans? From this study, we determined that foliar-applied sugar can deliver a positive return on investment for soybean growers. Next, we wanted to refine our study to determine the best growth stage at which to apply the sugar products. 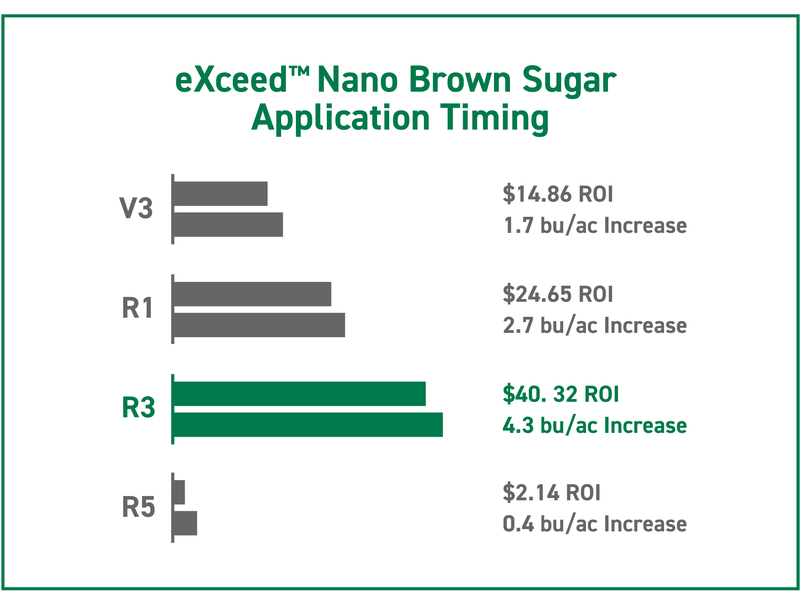 In 2016, when we applied eXceed™ Nano Brown Sugar at the R3 growth stage, we saw a near $30.00 per-acre return on investment. To expand the study, we applied 8 ounces of eXceed™ Nano Brown Sugar at the V3, R1, R3, and R5 stages. This time, the application during the R3 stage was the clear winner by a long shot, delivering an impressive $40.32 per-acre ROI based on a 4.3 bu/ac yield boost. The R3 stage is the optimal time to foliar-apply sugar on soybeans with the highest yield increase and ROI. Why such big results at the R3 growth stage? During the R3 stage, the soybean plant is forming most of its pods. The plant is transitioning from building sugars and storing them, to building sugars and translocating them into grain, which we eventually harvest. It’s during this time that the applied sugar seems to be most useful. 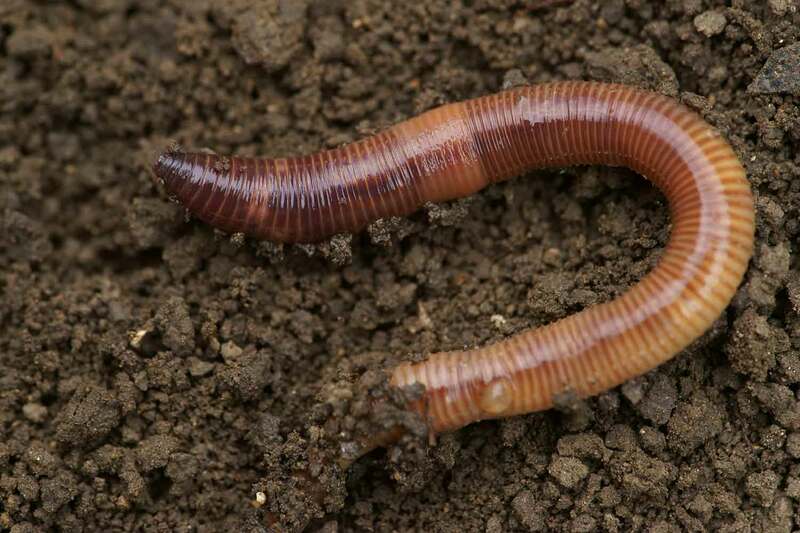 Sugar has two primary benefits: It provides a shot of energy for soil microbes, and it helps build sugars within the plants themselves. We think this is why we’ve seen the best ROI at the R3 growth stage. Should you use foliar-applied sugar on your soybeans? At AgRevival, we believe that foliar-applied sugar is a worthwhile investment for soybean growers. Apply at the R3 growth stage if possible, but if you can’t make a separate pass for whatever reason, you can apply the sugar at the R1 stage along with other spray products. When choosing your sugar product, remember that the size of the sugar molecules is critical. As our early trials demonstrated, if the molecules are too large, you won’t see any positive results. If you have more questions regarding this study, please reach out to us at AgRevival via our contact page.